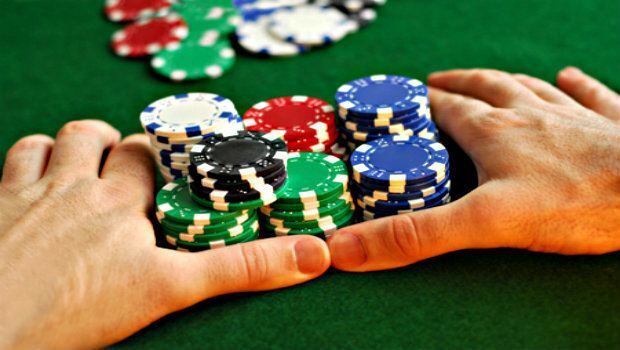 One of the most exciting moves that a poker player can make, whether in a land or online casino, is going all-in in a game of no-limit poker. Everything is put on the line. If you’re playing on a site like Betfair Poker, it’s as simple as clicking and nervously waiting. Some online poker sites even ban chat during all-ins, to prevent goading or any unfair influences on other players’ decision-making. When playing poker in general you should always wait for your turn. During an all-in this is especially important, as someone’s entire game is being wagered. You should never announce or call an all-in before it's your turn, and you certainly shouldn't muck out of turn either; seeing other players folding could have a large influence on those who are yet to act. In certain situations, it is frowned up for a player to fold even when it is their turn if they have the option to check. Since that player is not facing a bet, it would be considered 'folding out of turn' because it reveals information to other players who have not yet had their turn. If you've already folded, talking about the hand in progress could give an unfair advantage to the players still in it. For instance, you might give away information about which cards may or may not still be in the deck. Again, you should bear this in mind at all times in poker, but during an all-in this could give a calling player more knowledge about their chances of winning than is fair. You may have seen famous "poker brats" like Phil Hellmuth, Tony G and Dave “Devilfish” Ulliott goading players into an unlikely call. It certainly makes for entertaining TV, but it won’t go down well in a live game. Tensions run very high during all-ins, and it’s absolutely the worst time to try to cajole your fellow players. You could even receive penalties or be removed from the game for doing this. Slow Rolling - taking longer than is necessary to reveal your strong hand - is frowned upon at the poker table. When someone goes all-in, it’s both childish and rude to give them hope when you know that they're beaten. No one will be amused, so don’t drag the game out. Instead, behave in a timely and respectful manner. Similarly, always remember that there can be such a thing as a bad winner. There is no need to rub salt into the wounds of those you beat, so be respectful - you have just taken their money after all - and try not to give in to the excitement of celebrating too wildly. If you keep these tips in mind, the next time you go all-in during a live poker game you can do it with class.